House Republicans managed to move their bill repealing and replacing the Affordable Care Act out of a committee early Thursday morning, despite increasing dissent from Democrats and the healthcare industry. Lawmakers debated for nearly 18 hours and conducted dozens of party-line votes before moving the American Health Care Act out of the House Ways and Means Committee. The final vote came close to 4:30 a.m. EST on a slew of tax provisions in the bill. The Energy and Commerce Committee is still working on Medicaid reforms in the bill in its own markup. Democrats on the two committees marking up the proposed AHCA did everything they could to block the bill's advance until the nonpartisan Congressional Budget Office scores it on cost and coverage impact, which is expected sometime next week. They also pressed Republicans on why they are trying to ram the bill through with no hearings or expert witnesses, unlike the extensive hearing process preceding passage of the ACA. Democrats stressed the likelihood that the bill's reduced premium tax credits and Medicaid spending cuts would increase the nation's uninsured rate, drive up uncompensated care and cause hospitals to lay off workers. Check out our list: What's in the Obamacare replacement bill, anyway? 13 things to know about the ACA repeal bill. 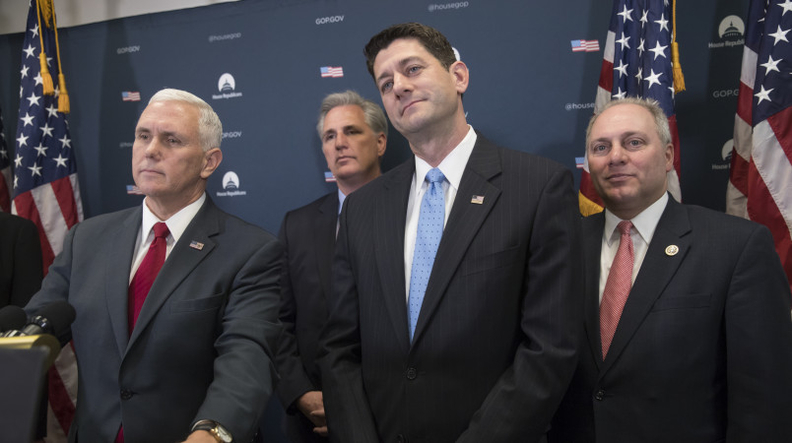 House GOP leaders unveiled the 123-page bill Monday night, dividing it into two parts to be marked up by the Ways and Means and Energy and Commerce committees. With no public hearings scheduled, they want the committees to approve the bill this week and have the full House vote on it next week. Senate Majority Leader Mitch McConnell has said he wants the Senate to vote on it, likely with no hearings, before the Easter break starts April 7. In the Ways and Means Committee Wednesday, Republicans started by examining a provision in the bill that would repeal the ACA's $500,000 limit on deductibility for health insurance executive pay, which will cost the U.S. Treasury an estimated $400 million over 10 years. Democrats immediately leaped on that as an example of what they called the bill's “reverse Robin Hood” approach of giving wealthy American's big tax cuts while reducing subsidies and coverage for low- and middle-income people. “This huge tax giveaway to insurance CEOs will be paid for in part by reducing coverage for middle-class, working families and by serious reductions in Medicaid,” said Rep. Ron Kind (D-Wis.). Ways and Means Democrats offered a series of amendments, including measures to require that the legislation not increase the federal deficit, not increase the number of uninsured Americans, and not drive up uncompensated care or cost healthcare jobs. In the Energy and Commerce Committee, Democrats demanded that the bill be read aloud, which took about 90 minutes. The committee's senior Democrat, Frank Pallone of New Jersey, and Rep. Raul Ruiz of California took turns peppering Chairman Greg Walden (R-Ore.) with parliamentary questions about logistics on how to best object to the law and when amendments had to be submitted. The mild-mannered Walden grew increasingly annoyed. Democrats on both committees asked that the markups be postponed until the CBO issues its score on the bill's fiscal cost and effect on the nation's uninsured rate. It's widely expected the CBO will project that millions of people covered by Obamacare would become uninsured. But those amendments were rejected on party-line votes. “Lacking a CBO score isn't something that is small or insignificant,” said Rep. Anna Eshoo (D-Calif.). “We need to know what this is going to cost; we need to know what sort of health insurance is going to be possible." Ways and Means Chairman Kevin Brady of Texas argued that Democrats proceeded to mark up healthcare reform legislation in July 2009 without waiting for a full CBO report. But in a sharp exchange with Brady, Democratic Rep. Sander Levin reminded him that Democrats did have a July 14, 2009 preliminary analysis from the CBO before starting the markup. Democratic Rep. Lloyd Doggett of Texas asked Brady to postpone the markup until March 16 to allow time for at least one public hearing to discuss the bill. He insisted that the Trump administration send a representative to testify before the committee to discuss how the bill meets President Donald Trump's promise to cover everyone at less cost with better coverage. Doggett noted that before passing the ACA, House Democrats in 2009 heard 181 witnesses in 79 hearings, while Senate Democrats held 53 hearings. He compared the process of evaluating the GOP bill to the way consumers buy a new pair of pants. A growing number of healthcare stakeholder groups, including the American Hospital Association, the American Medical Association, the Catholic Health Association, America's Essential Hospitals, the Association for Community-Affiliated Plans and AARP, have come out against the bill in its current form. Insurance industry leaders have expressed doubts about whether the bill would help stabilize the individual market and make it possible for them to offer plans for 2018. And congressional conservatives have sharply criticized the bill as “Obamacare 2.0,” saying it offers a new and costly entitlement and keeps too many of the ACA's insurance market rules. On Wednesday, House Democrats repeatedly urged Republicans to slow down, get more input and make sure their legislation is carefully crafted.